The Texas Social Media Research Institute (@TSMRI): How to Use Twitter to Study and Complete Projects! How to Use Twitter to Study and Complete Projects! If you need to prepare for a test or complete a project, Twitter and other social networks can be a great way to get organized and do your best work. 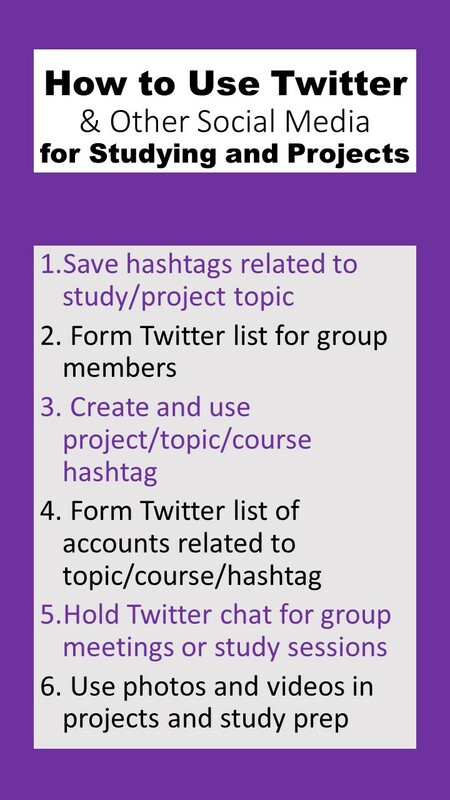 Save hashtags related to the topic of the course or project. Whatever topic interests you, there's probably already at least one related hashtag. If you're logged in on a computer, you can save searches and use them on a mobile device. Form a Twitter list for group members. You can create Twitter lists on a mobile device or a computer. Twitter lists help you find out what's going on with specific people without getting all the clutter that's in your news feed. This way you can see exactly what's going on with your group members. Create and use a project, topic, or course hashtag. Your professor may have a class hashtag. If not you can create one. Just pick one that's not already being used so you don't get other information in the stream. Form Twitter list of of accounts related to topic, course, or hashtag. You can also use twitter lists to "listen" to leaders and leading organizations in the field. Hold a Twitter chat for group meetings or study sessions. If you can't physically meet at the same place at the same time, you can meet online using a Twitter chat. This also works well for online classes. Use photos and videos in projects and study preparation. You can create images and videos to review topics or update status on projects. If you liked these tips, check out the infographic below! Here's our video on Katch! How do you prepare for tests? How do you get projects done? These are some great suggestions. I do use hashtags for my courses (i.e. #BCIS5304). But, identifying a list of relevant hashtags makes so much sense. I could simply include them somewhere on my syllabus and as I identify more, add them to my list. Then, simply copy and paste into Tweets as necessary. Great thought. As for the lists, I have not quite mastered that one yet either. Still working on it though. I appreciate all that you do and the helpful sharing of tips. Thanks, Dr. Schuesler! Glad you found the suggestions helpful. You're doing a great job already. I like the idea of including them in the syllabus and adding to them as you discover more. I do something similar with example journals for citations in assignments. Doing something similar for hashtags is brilliant!